This week marks the beginning of another beta season for OnePlus. They are rolling new Open Beta builds for their eligible phones which include 2017’s OnePlus 5/5T and 2018’s OnePlus 6/6T. The build number for OP5 is Open Beta 26 whereas it is Open Beta 24 for OP5T. The update servers went live yesterday and a small number of users received the OTAs. We have a strong collaboration with Oxygen Updater and it’s developers, thus tracking these builds are not so difficult. But when the internal tracker failed to get update information from OnePlus this time (even after after several hours), we started to speculate something fishy. While we had our hands on the update zips, and the tracker confirmed us about the existence of the update zips on OnePlus server, they were later made offline. Later on, community members started to complain about inability to complete the update, getting bootlooops, extreme lag and several other symptoms related to this specific update for OnePlus 5/5T. OTA update failed while installing. Now my phone is not booting and is stuck on a black screen and LED on. Recovery mode is also not working, Only fastboot mode is working. What to do? 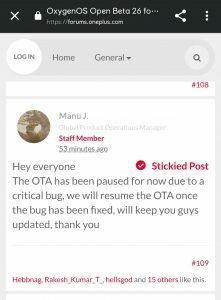 Now OnePlus staff member Manu J. officially confirms that they need to pause the OTA due to ‘critical bug’. Well, that’s not the end of the drama. We have already discussed about shared codebase between OnePlus phones. Thus the newest Open Beta for OP6 & 6T are also speculated to be buggy. In fact, we have again got our hands on the update zips for OnePlus 6 duos, but now they seems to be offline. Eminent OnePlus community member Funk Wizard, who is also a moderator in OnePlus official forums, has seconded the speculation. OTA is paused for the time being, please wait for it to resume! While no official announcement for halting the OTA rollout for OP6/6T is public at time of reporting, the evidences clearly indicate the certainty of the event. If we categorize the symptoms of the bugs present in these beta builds, the top one should be the bricking reports. The affected users chose to download and apply the update after being prompted by the OTA client. Afterwards both normal boot and booting to recovery were broken, but bootloader/fastboot mode remained accessible for them. On the other hand, some users were able to complete the update. Call it a coincidence, they all received the full update zip instead of the incremental one – at least the persons we communicated with. OnePlus skips smaller incremental updates if the bootloader is unlocked or the system is tampered (rooting, installing mods etc.) and offers full update zips. In that case, users still have the ability to revert to an older build or backup/restore their data via TWRP as the bootloader is unlocked. We are gathering more users feedbacks and yet to dissect the update zips. But there is a strong possibility of a botched up incremental update zip generation and/or a glitch inside the new bootloader or firmware. For safety reasons, we don’t publish the links to the update zips. Readers are also suggested not to update manually to these beta builds. According to reports from users, the update rollout is still continuing on some regions despite the official announcement. Even if there is an update prompt, especially the incremental one, try to stay away from it. 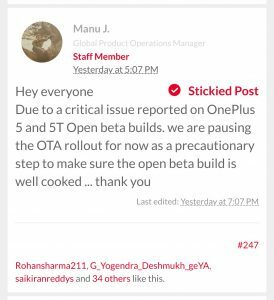 Manu J. dropped another announcement about officially pausing the rollout of Open Beta builds for OnePlus 6 (OB12) and 6T (OB4). Another announcement was made by Manu and they officially acknowledged the bricking issue. We have received reports of OTAfailure and Device not powering on after updating to the latest open beta builds on Oneplus 5 and 5T, based on these reports we had paused the OTA updates. We investigated further and uncovered some previous incidents of botched OTA updates by OnePlus – take a look.